I have a hot press that I have used for years for flattening warped tefillin bottoms. I got it from another sofer about four years ago. It died a very final death today and I need another one. Before putting in the money, though, I would be interested in hearing other techniques/equipment used for flattening warped tefillin bottoms. Please Share! This is a little different than our usual topic. I will soon have the opportunity to be in Yerushalayimg for the first time since becoming a sofer. Any recommendations for places I can buy supplies including stocking up on some klaf, and some tikkunim. Also, any good seforim stores in the yerushalayim that will have a good selection on st'am. Just thought I would share this and see what the forum thinks. The mashkof is an AC duct that has been lightly plastered and drywalled over, while the "mezuzos" are both built-in cabinets that are thoroughly attached to the walls and floor. 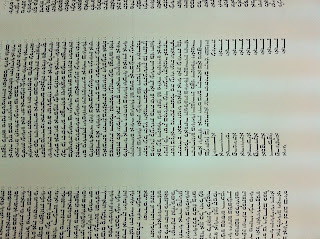 Someone sent me a picture of a megillah they were offered by a Sofer in Eretz Yisroel. It looks like it has been written first in pencil. Is this possul due to a: Ksav al Gabei Ksav and b: Shinuy tzurah of many of the letters caused by the pencil marks underneath? Rav Stern in Mishnas Hasofer 3:8 writes that this is posul for Tefillin Mezuzah and Sefer Torah is there any reason why the same halocha would not apply to a megillah? He also writes in 8:9 that pencil marks made by a magiah can cause a shinuy tzurah, presumably that would also apply here.